Bicycle advocates have a difficult job. Winning improvements for cycling is hard enough, but then every gain they make can become the target of lawmakers who see cyclists as obstacles to be removed from roadways. Such lawmakers often try to hide their initiatives under thin veils labeled “safety” as if they are doing cyclists a favor. Such false “safety” initiatives are usually packaged in laws that require cyclists to wear things, which make cycling less convenient and often impossible for impoverished cyclists without breaking the law. 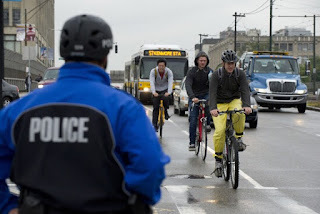 Such laws force impoverished cyclists into becoming targets for police harassment because they have no other transportation option. The most common of these sorts of laws are mandatory helmet laws. Others include reflective vests or other supposed safety gear. These sorts of malicious initiatives are so harmful to any bicycle program that I made sure to include a short section on bicycle advocacy in Defying Poverty with Bicycles. The book focuses on setting up a community center where people can find bikes and careers. And yet even these program leaders must be alert for threats like these to ensure they participants can ride. Even though such threats are common, I was stunned earlier this year when I read about the situation in New South Wales, Australia. Australia is already crippled by a nationwide mandatory bicycle helmet law, which likely emboldened brazen lawmakers. They took these deceitful tactics several notches higher with increased fines and an additional requirement for cyclists to carry ID. Read more about it here. So I’m happy to report that they didn’t get away with it. This recent article gives a nice overview of the successful response from bicycle advocates. We can let out a sigh of relief for everyone in New South Wales who needs to or will ever want to ride a bicycle. And yet we cannot ignore the fact that bicycle advocates had to spend more than a year battling this ridiculous threat when they could have given their energy to creating kinder communities. We all have to keep a careful eye out for and then stomp out even the slightest hint of such threats or we could be faced with an escalation like they saw in New South Wales.